Join the Science Spectrum & OMNI Theater for a night full of carnival games, prizes, trick-or-treat, the Spooky Scientists Show, spooky lab experiments, the Haunted Lab, spooky critters, children and family costume contests, and other spooky-not-scary Halloween activities! All sites on the trail will showcase artwork catering to the Day of the Dead theme. Traditional refreshments and entertainment will be available at each location. Start the procession at Texas Tech’s International Cultural Center and follow along to three other galleries. Come and enjoy the spirit of Halloween with the University Symphony Orchestra as they entertain audiences with a spooky twist on classical tunes. Show up to the stadium in your costume and watch Texas Tech play a 7-0 Oklahoma State team. The Jones is known to get rowdy and cause upsets when playing around Halloween, so this will be a game you won’t want to miss. If you can’t snag tickets to the game, walk next door to The Roof at Raider Park Garage to see the field from a new view and get the Halloween party started with DJ Soulfly. Whatever your phobia may be, you will surely find it in the four various themed attractions, alongside raucous performers and an exciting environment at Nightmare on 19th Street. Come celebrate this cultural holiday with your family and friends at the Lubbock Memorial Civic Center. Attendees will have the opportunity to see the work of several Latino artists, experience cultural music through local performers, participate in a Los Muertos cake decorating contest, view a car exhibit and much more. 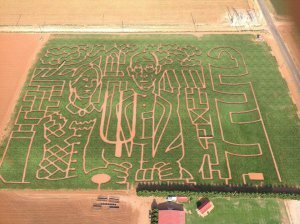 Attendees will have the opportunity to get lost in the maze, enjoy a wide array of food, participate in thrilling hay rides, see festive pumpkin art, and shoot the corn cannon. We hope to see y’all getting spooky this Halloweekend! Make sure to share any Lubbock-inspired costumes with us using #LiveLoveLubbock and check our calendar for all non-Halloween related events.